DEC. 7, 1909, THE CHARGE. 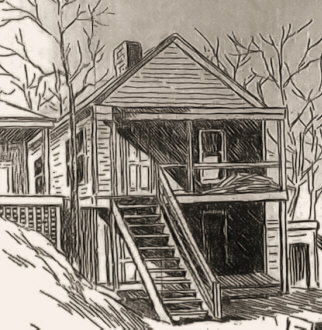 That he married one woman, with whom he makes his home, twenty-seven years ago, and another, who, until Sunday lived as his wife at the Hotel Kupper, on December 7, 1909, is said by Captain Walter Whitsett of the police department and Norman Woodson, an assistant prosecuting attorney, to have been admitted by Benjamin Franklin Hughes, 124 North Hardesty avenue, in a statement secured from him in the matron's room at police headquarters last night. Hughes was arrested yesterday on complaint of Valerie W. Wiler, who lives with her mother, Mrs. Cora Westover, and her sister, Clarice Wiler, at 1622 Madison street. To Lieutenant Robert Smith at police headquarters Miss Wiler represented that she had been married to Hughes, who has a wife and family at the Hardesty avenue address, by Probate Judge Van B. Prather in Kansas City, Kas. The ceremony, she said, was performed Tuesday, December 7. Miss Wiler was under the impression that Hughes had left the city when she notified the police. It was later determined that he was home with Mrs. Hughes. Officer Oliver A. Linsay made the arrest. The man was held in the matron's room last night and will remain there until an investigation is made of the charges against him at 9 o'clock this morning. Benjamin Hughes is 52 years old, and has lived in Kansas City two years, coming here, Mrs. Hughes said last night, from Glasgow, Mo. He is said to come of an excellent family and has dabbled in politics. The details of Hughes's statement were not given out last night. It was announced by the prosecutor and Captain Whitsett, however, that he broke down and admitted marrying the Wiler woman in Kansas City, Kas., Tuesday a week ago, giving as his reason that pressure had been brought to bear upon him to unite with the girl. According to the statement he was married to Mrs. Hughes in Osborn, Mo., April 16, 1882. The ceremony was performed by the Rev. James E. Hughes, pastor of the Baptist church there. Three children, two boys and a girl, were born to them. The oldest son, aged 20, is a clerk in the First National bank. The other son is 16 years old, the girl 11. Few clouds, he declared, darkened his married life until he met the Wiler woman last April. Mrs. Hughes had been congenial, a good, Christian woman whom all respected. Valerie Wiler last night said she had first met Hughes when she was in the inmate of a home ofr girls at Chillicothe, Mo., under the care of Mrs. E. Carter. She believed the man was a state officer inspecting such public institutions. he seemed to like her at first sight, and came to see her often. Finally he induced her to become his wife. Leaving Chillicothe, she stated, they went directly to Kansas City, Kas., where she gave her age as 17 years, while Hughes gave his as 45. She produced a certificate on which both names were signed together with that of Judge Van Prather who officiated at the wedding. After the marriage, she said, the went to the Hotel Kupper where her supposed husband registered ans Frank Hughes and wife. They stayed at the Kupper several days. "I discovered my mistake last Sunday morning when I was visiting my mother," said Miss Wiler. "She was aware of the attentions paid me by Mr. Hughes and told me that he had a wife and family on Hardesty avenue. I decided to find out if he had deceived me at once. "Mother, my sister Clarice and I went to the Hughes home about 6 o'clock Sunday evening. We were allowed to enter unannounced, and found the man whom I had supposed to be my husband there surrounded by his family. He was very much frightened, got up quickly, and asked if he could see me alone for a few minutes. I would not listen. It did not take me very long to tell him that what I had to say was to be to his wife as well as to him. "I said to Mrs. Hughes: 'Madame, I have married this man and have the certificate to prove it. We were married last Tuesday.' Then I threw myself at her feet and begged her forgiveness, telling her it was not my fault, that i knew nothing of any former marriage when I allowed him to lead me into matrimony. She forgave me then and told her husband that he was worse than I was. Later she seemed to take it all back, and when I went again to the ho use with my mother and sister tonight she treated me coldly. She even ordered me out of the house. I guess she is a perfect Christian woman. Anyway I loved her at first sight, and feel deeply sorry for her. When Hughes was courting me he offered me many inducements to become his wife. He said he had been a member of the legislature and owned property in town and a farm near Cameron, Mo., worth in all about$75,000. He admitted that he had been married once, but added that his wife died eight years ago. 'I never loved her as I love you and we will be a very happy couple if you will have me,' he said once. "Sunday night when we confronted him before his wife in his own home, he asked to speak with me aside. I refused, and he seemed very much annoyed. Finally he managed to get close enough to my ear to whisper, 'If you will make up with me, honey, we will get out of this town and go to Mexico.' I do not remember replying. The way he treated his wife did not suit me, although he was kindness itself to me from the first." At the Hughes home last night Mrs. Hughes would not be interviewed about her husband. She was nearly distracted over his arrest, she said. Occasionally as she spoke she hesitated, wrung her ands and repeated passages from the Bible. "This woman he married is a very wicked woman," she cried out once. "She drew my husband way to her through her evil ways. Lord have mercy on them both and me. My poor children." Golden Wedding Jubilee for Mr.
and Mrs. James H. Prather. As fortunate a fifty years of married life as has ever been celebrated is that of Mr. and Mrs. James H. Prather of Clay county, who will observe the anniversary Monday afternoon and night, first at their home, three miles north of Harlem, and then at the home of their eldest daughter, Mrs. W. J. Campbell at 2618 Olive street. During the half century since this pair became man and wife they became parents of six children, grandparents of fourteen children and great-grandparents of two children, and there has not been a divorce, a death or any great trouble in the family. James Prather, who is now 70 years old, is living in a stately farm house on the site of a log cabin in which he was born. His father, Barrett Prather, acquired the 120 acres comprising the farm, in 1832, when it was valued at $1.25 an acre. Clay county real estate has gone booming since that date and $700 an acre is an average value now. Mrs. Prather, who was Miss Margaret Emma Bradhurst, comes of a prominent Clay county family and was born but a few miles away from the Prather acres. She is 69 years old. Mr. and Mrs. Prather are possessed of sound bodily health and minds. Neither has experienced much sickness since their marriage. The names of the children are: Edward V. Prather, John B. Prather, Mrs. W. J. Campbell, Mrs. Oscar Westheffer, Mrs. George Barnes and Mrs. Rev. W. J. Parvin. All the children are married and every one of the descendants live within 100 miles of the farm and will be at the anniversary. A wife's faith in her husband was vindicated yesterday when John Hobbs, a Seventh Day Baptist street preacher and incidentally a watchmaker, came to Kansas City from Dorchester, Neb., to claim his wife and child, whom he supposed to be in La Crosse, Kas., but who have been at the Helping Hand institute since August 29. Mrs. Hobbs, a pretty Mexican woman, came here in search of her husband practically in a destitute condition. Her 6-months-old babe was ill and the grief-crazed wife refused to eat or sleep during the first few days, believing her missing husband either was ill or dead. The husband believed his wife and child were in La Crosse, where he left them, when he came to Kansas City in search of work. He traced them from the Kansas town here. Mrs. Hobbs is one of eight heirs to an estate in Mexico, said to be worth $1,000,000. During her search she refused to communicate with her relatives, or ask for financial aid. "Didn't I tell you that he would find me," excitedly exclaimed the little Spanish senora over and over again to Mrs. Lila Scott, the matron, and Mrs. E. T. Brigham the assistant superintendent at the Helping Hand, when her husband with a package of letters and telegrams he had sent her, appeared at the institute. About a year and a half ago pretty Amelia Lastra of Magdalena, Sonora, Mexico, met and fell in love with John Hobbs, an American missionary of the Seventh Day Baptist church in Mexico. Their religions differed and her family objected to the marriage but that counted for little. After the ceremony the young couple moved to another part of Mexico. While there Mrs. Hobbs learned that her father, Felippe Lastra, who owned two silver mines, was dead. Under the Mexican law the estate can not be divided until all of the heirs have given consent. Mrs. Hobbs is one of eight heirs. Hobbs and his bride finally went to La Crosse, Kas., where the husband worked for a few weeks and then came to Kansas City where he expected to make a home for his wife and child. From that time until yesterday all trace of him was lost. When Hobbs found his wife he carried a bundle of letters. They had been sent to La Crosse, Kas., where he had gone to find out why his wife did not reply to his letters or to the telegrams he had sent her. He said he had been preaching on the streets in Kansas City and was one of the street preachers arrested the latter part of August. He said he was given hours to leave the city and as he had no money had to walk. He made his way to Dorchester, Neb., where he got work and then sent for his wife. It developed after he had explained his absence that Mrs. Hobbs had failed to notify the postoffice in La Cross her forwarding address. The couple left for Nebraska last night. Hardly a night goes by without some person telephoning or calling in person at police headquarters and making requests that are not listed in the police manuals as among a copper's duties. If a refusal is met with it is not unusual for the officer's job to be threatened by the person making the request. Last night was possibly a bit quiet but Lieutenant M. E. Ryan, in charge at headquarters, received two demands to detail officers to perform work that is commonly turned over to the private detective agencies. The first request was made by a woman who demanded that a policeman be sent out on Admiral boulevard and take her husband home. She had found him calling upon another woman, and the wife wanted him escorted home after he declared he would return later in the evening. Demand No. 2 was made a few hours later. A man hurried into the station and walking up to the desk inquired for the Chief of Police. As the chief was not there he asked for the captain and was informed that a lieutenant was about his size. He then asked to have a plain clothes man follow his wife out to one of the parks during the evening and keep an eye on her actions. "Guess you will have to do your own trailing," Lieutenant Ryan remarked. "Gertie always flirts when I am not with her," the man said in further pleading for a policeman to spy for him. "Then watch her," the lieutenant answered as he told the shortstop to put the man out of the station. After a trip of 5,270 miles in search of her husband, who she says left her on account of "too much mother-in-law," Mrs. Edward C. Sterling of Chicago located her wandering spouse in a cottage at 2912 Fairmount avenue at 12:10 o'clock yesterday morning. "Yes, I am going to stay right here with my husband," she said, "and we are going to have no more mother-in-laws to bother us. I have the utmost confidence in my husband, and I know that he would not have deserted me of his own accord." Mr. Sterling refused to make any statement, and regarded his wife with a pleased expression as she told about his numerous excellent qualities. On the 16th of last February, according to Mrs. Sterling, her husband told her, as they were returning home on a street car after a visit to one of the best theaters in Chicago that the air of the theaters had affected his brain and had made him rather ill. He went back on the rear platform of a car and that was the last she saw of him until he responded to the gentle raps of Sergeant Jerry Caskey on the front door of his house yesterday morning. Mrs. Sterling in her search visited most of the Western cities. At Los Angeles she was told by her husband's mother that the missing man probably could be located in Kansas City. Accordingly she came here. Some how Mrs. Sterling imagined that her husband might be a victim of the "affinity" habit, and she was more than overjoyed to find that her fears were groundless. "I'm going to stay with him," she declared. Bride Booked for Municipal Court. When Ben Green, who is deaf, married Eliza Reamer, who is tongue-tied, last week at the home of his mother in Lawrence, Kas., everyone thought the match an excellent one, though the couple had known each other only a week. With light hearts they boarded a train for Kansas City, where they intended to spend their honeymoon. Possibly the world at large wouldn't have known about the union if they had not been arrested at Independence avenue and Holmes street yesterday afternoon. They were quarreling. Both were taken to police headquarters and charged with disturbing the peace. In default of bond they were kept at the station. Mrs. Green, in the matron's room, attempted to tell about her marriage. She met Green in Wichita a week ago, she said. It was a case of love at first sight. Green persuaded her to go to Lawrence, where they were united. The husband was unable to find work, she said, and they quarreled. The case will be tried in the municipal court this morning.